"The Achievement of Constitutionalism in Asia: Moving Beyond 'Constitutions Without Constitutionalism'"
Abstract: The phrase “constitutions without constitutionalism” has been used by various authors to describe the state of constitutional law in Africa, the Middle East and Latin America at various points in time. For significant periods, the constitutional circumstances of many Asian countries may also be aptly summarised by “constitutions without constitutionalism”. As it is by no means obvious or likely that a nation’s constitution will be successfully put into practice after it has been enacted, it is indeed right and appropriate to talk of constitutionalism as an “achievement”. In the early twenty-first century, constitutionalism is still a work in progress in many parts of the world, particularly in Asia, Africa and Latin America. Many Third World countries have still not grown out of the syndrome of “constitutions without constitutionalism”; the “achievement” of constitutionalism is yet to come. Just as Fuller speaks of the project of legality or Rule of Law as being governed by a “morality of aspiration”, which means whether the ideal of the Rule of Law is realised in a particular country or legal system is a matter of degree, and the practitioner of the morality of aspiration should try her best to achieve excellence in, or a higher degree of fulfillment of, this ideal, so this “morality of aspiration” is also applicable to the practice of constitutionalism. The achievement of constitutionalism in a particular nation-state is also a matter of degree. The book project of which this paper forms a part attempts to inquire into the state of constitutionalism in Asia in the early twenty-first century, or the extent or degree to which constitutionalism has been “achieved” in this part of the world at the present time. Although constitutionalism as a theory and practice of government and law first originated in Western Europe and North America, there is by now considerable evidence of its positive reception in and successful “transplant” to a significant number of Asian countries. 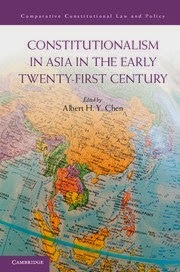 As I wrote previously, “A macrohistorical perspective, covering developments in Asia since the late nineteenth century, suggests that constitutionalism has broadened and deepened its reach, significantly, over the course of time.” The experience of different Asian countries in this regard provides useful and fascinating case studies of what Grimm calls the “achievement of constitutionalism”. This paper consists of two main parts. Part I attempts to develop a conceptual framework for the purpose of studying, analyzing and evaluating constitutional, political and legal developments in countries on their path towards the “achievement of constitutionalism”. Part II discusses the experience of Asian countries and jurisdictions from a historical and comparative perspective, utilising the conceptual apparatus developed in Part I. Click here to download the full chapter.